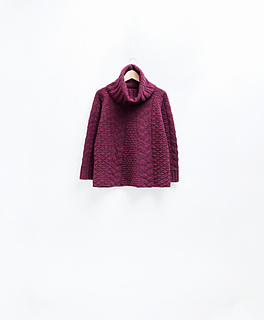 Inspired by the work of Frank Lloyd Wright, Midway features a broad A-line skirt accentuated by triangular chevron panels in varying scales. 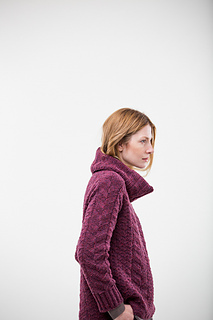 A generous ribbed cowl neck balances the shape and provides the coziness of two layers of Shelter. 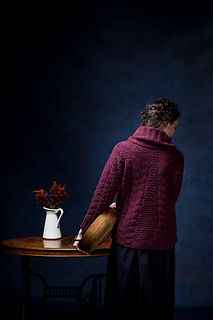 The pullover is worked entirely in the round with sinuous raglan shaping and short rows. 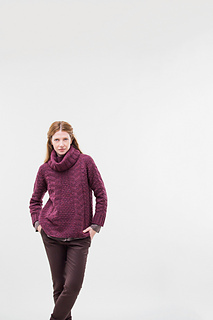 Midway is designed for a relaxed fit; we’ve styled it with 7” of ease. 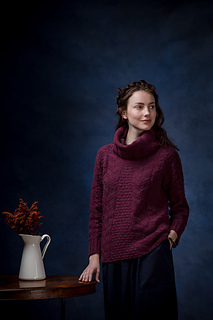 The need to keep a variety of motifs in pattern during shaping and short rows makes this design most suitable for intermediate to experienced knitters.